2017 Q2 - Lesson 11: "False Teachers"
“They promise them freedom, but they themselves are slaves of corruption; for people are slaves to whatever masters them” (2 Peter 2:19, NRSV). In his first epistle, Peter, with great pastoral concern, sought to encourage readers in regard to the perils of persecution. But the church faced another threat, one perhaps even more dangerous than outside persecution. And that was the threat from inside. 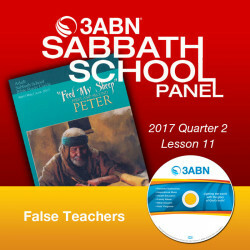 Just as the Jewish nation in the past had to deal with false prophets, the follower of Jesus in Peter’s day had to deal with false teachers who would “secretly introduce destructive heresies”.